Carl Ray was born on the Sandy Lake reserve in Ontario in 1943. He was one of the generation of children that had been removed from their homes to residential schools to be acclimatized to a mainstream Canadian lifestyle. He left school at fifteen when his father died. On his return to the reserve he tried to make a living as a hunter and trapper but those traditional skills hadn't been taught at the school and he failed miserably. He'd always shown an interest in art and had an ability to draw, but at the time it wasn't considered an activity that any First Nation's man could do for a living. He left the reserve to work in the gold mines at Red Lake, Ontario and fell into a rough and tumble lifestyle. He caught tuberculosis, recovered in the sanatorium in Fort William and returned home in 1966. There he met up with Norval Morrisseau who had returned a few years earlier from his successful debut as an artist in Toronto. In his own way - by painting the spiritual reality of the traditional Ojibwa - Morrisseau intended to restore cultural pride to his community, despite being chastised by the elders. He encouraged Ray to do the same. Morrisseau had been given a contract to create a large mural on the Indian Pavillion at Expo '67 and he took Carl along to help with the job. Norval had designed and sketched the mural but both he and Carl did the painting. In the end, Norval left the site and Carl completed the project. It was a more confident young man who returned to northern Ontario. He began painting seriously and found that there was now a market for his work. He also discovered there were commercial possibilities. 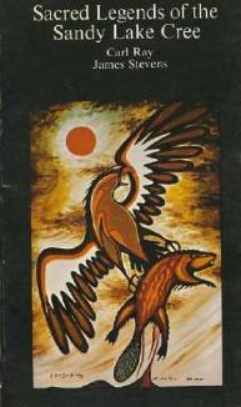 Carl did the illustrations for "Legends of Sandy Lake" a book by James Stevens published in 1971. The illustrations were done in a more ascetic style than he normally chose and Stevens reported later that the painter regretted and/or resented that a portion of the mainstream market expected him to continue to produce work in that style. After Jackson Beardy, Alex Janvier and Daphne Odjig had their ground breaking exhibition Treaty #'s 23, 287, 1171 in Winnipeg in 1973, they, along with Carl Ray, Norval Morrisseau, Eddy Cobiness and Joe Sanchez launched the Professional National Indian Artists Incorporation. Shortly thereafter, Carl Ray, Gerald Dokis and Daphne Odjig were enrolled by Tom Pelletier to teach at a summer school held on Schreiber Island north of Manitoulin. Many of the students went on to achieve reputations as Indian artists with their own unique visions but with painting styles that reflect the woodland artists that preceded them. Hired by the Department of Education in Ontario Carl taught art at schools in dozens of towns in northern Ontario. The Department of Indian Affairs also paid him to visit other communities and reserves. The artist received commissions to do large scale murals at schools and at the Sioux Lookout Fellowship and Communications Centre. He was also collected by notable individuals and institutions. Carl Ray was stabbed to death in a drunken brawl in Sioux Lookout in 1978.